I'm going to be sharing with you three Reality Transurfing techniques that go beyond the Law of Attraction. These are things that when I began to apply in my life, changed everything. Today, I'm going to be sharing with you the most powerful manifestation process I've ever found, which is called Reality Transurfing. The Reality Transurfing shows us how to manifest from a point of view of understanding quantum physics and understanding the mechanics behind manifestation. It really explains in balances out the views of thoughts when it comes to eastern and western philosophy and in an example of this, think of it like, how would I have an intention for something and then let go at the outcome. Many times we'll say, well, I want this, but there'll be social conditioning, which means the way that so many people on the world think that's ingrained into us that blocks us from actually experiencing what we want. What Reality Transurfing does is it's a process that shows us that what we want to experience already exists. Therefore, with the old Law of Attraction way of thinking that we need to create our own reality. It's more so understanding that the reality we want to create already exists in a certain frequency and if we learn the energy dynamics of how to tap into that, we then experience it more for ourselves. First off, reality, Transurfing is a book that is written by a quantum physicist named Vadim Zeland. It's a book that was recommended to me by a friend when I was out at lunch one day with them and he said, hey, have you. What do you think about reality transcription? And I said I'd never read it. He's surprised I hadn't read it. So, I go home. I read it. It's like a 500-page five-part book, and it was, to be honest, kind of dense to read. However, it completely transformed the way that I saw the whole process of manifestation. I began to apply it in my life and within about a year, everything in my life changed. I went from having a nine to five job to being full time on YouTube. I learned how to really tap into my own authenticity because that's the other thing, Reality Transurfing shows you how to do, how to create your own wave of success. You may notice that behind me right now is that painting, that painting is based on the success of me using the power of reality, Transurfing, which has to do with understanding the energy dynamics behind it, of what propels someone to be authentic to who they are. If you've ever felt like you couldn't be free to be yourself, that comes from social conditioning. When you break out of the social conditioning, that's when everything begins to change. Think of it like living in the matrix and then you become neo and you realize that you can go beyond the matrix and that you then have all of these abilities you didn't know you had. That's like no joke. It's that powerful and when I started to apply it in my whole life changed and so actually I'm going to explain some of the techniques here today, but it's actually also the reason I'm in this house. I Use Reality Transurfing the is something called outer intention to get this house and I wouldn't be in it if it weren't for Reality Transurfing, so reality Tree and surfing is a book by a deemed Zealand and it's the most powerful processes I've ever found. There is something also that I have that is called Reality Shifting Academy, which teaches reality. Transurfing. You get me giving you videos every single week as to how to apply reality, Transurfing. You get what is called a pendulum of the success of other people that are thinking similar thoughts, which is a mastermind. And that adds to your own success and you pretty much get all the bonuses, meditations that you wouldn't even see on YouTube and a whole bunch of other perks as well, and I've made it much more affordable for people to do so because the one on one coaching with me would be about would be much more than $47 a month. This is a way to get me to help you in the process of creating what you want and reality transfer. If he really is something you can read the testimonials as well to see there are so many of hundreds of people that have been through the academy and the results have been phenomenal. People getting jobs that they want, that they never thought they were worthy of people getting into relationships and blossoming and new ways of success. That clear create a wave of success than they ever thought possible. So, read those testimonials as well, just to see what is possible. The first technique I want to talk about today is actually that of creating a pendulum and detaching from old pendulums. Think of it like this, a pendulum in the book reality. Transurfing is a thought structure, so just like we're thinking thoughts right now, we think our thoughts don't have form, but in actuality, our thoughts do have a forum. Our thoughts are an energetic pattern that even though we can't physically see with our eyes, it still exists. We have an active field around our body and when we're thinking thoughts are these thoughts going in recycling within our energetic field that are going around and around our body and when we think consistent thoughts that add to our energy field. The same way we have an energy field around our body. There's an energy field around the planet and you have billions of people on the planet thinking similar thoughts. These thoughts could be at range from anything to do with am I worthy or thoughts of the social conditioning of wanting certain sports teams to win. And the idea is whatever these thoughts are going around the planet, they exist there and other people pick up on those thoughts. For example, you may be driving down the road, somebody cuts you off in traffic, you may get mad, and then instantly you will begin to link up with other thought forms of other people that been cut off on that same road before thinking that that added emotion is you. That added emotion is not necessarily you. That is the social condition of those pendulums. And when you learn how to observe those thoughts, observe those pendulums, you begin to disengage from them. And that's why what Reality Transurfing is really about is disengaging from the pendulums that bog people around. What are some powerful pendulums in society? You must go to college to be successful. There are pendulums of do you feel worthy and you're not worthy because you're not doing x, y, or Z. There are pendulums around every single thing you can think of my YouTube channel is a pendulum. The idea is that I make it a pendulum that helps people because there's a lot of people focused on the channel. There are pendulums around that, have sports teams. When you go to a sports games and you feel the thrill of being there, it's because you're tagging onto an energy-momentum of that, of that pendulum, of that thought form. Whoever will win the presidential election, we'll have whoever has the most attention, whether it's positive or negative. The thing with pendulums is the more you fight a pendulum, the more that it actually resists, the more that strong that it becomes. If there's a pendulum in your life, a pendulum or a thought structure that says something like you have to go to school to be successful, the more you fight that, the more than it actually is there. The key is to observe it and then to let it go. You don't want to fight a pendulum and there are pendulums around every single thing. The idea around this is to actually become free of the pendulum by first of observing it. You can also have a positive pendulum. A positive pendulum is people focused on a similar outcome, so if you have what is called the mastermind principle, like the classic in Napoleon Hill's think and grow rich. That is where people, multiple people create a pendulum, and that pendulum then creates a wave for those people that are focused on it to ride on. In the Reality Transurfing, if you know the reality shift can academy that I have, we have hundreds of people in a Facebook group where we do live Q&A's and we focus and tree a pendulum together where we create success to where simply by being in the group, you tap into that of the powerful pendulum. What we do is in each meditation that we do or each live Q&A, we connect to our heart centers together and we increase the vibration of all of us connecting together so that it carries us into the success that we want. That vibrational alignment that we want. That is the power of a pendulum. If you are to link up with other people in a powerful way and thinks similar thoughts and have similar intentions, that's where the power begins to happen. And like I said, the reality is shifting academy. We do that together. In general, becoming aware of pendulums, observing them and then let him go. We'll allow you to become more free to be yourself and then also set the intention for your own pendulums where you don't let it carry you. Don't let it control you, but you let it carry you if you so choose with awareness. A pendulum is a powerful understanding of how to disengage with the old that didn't create the new. And it's the thing that so many people don't even know runs their life. They think they're thinking their own thoughts. Thoughts are just there, they're not who we are. And the more we realized that the more we start to gain our power back. The second technique I want to share with you is actually called the wave of success, which is what has allowed me to create my YouTube channel and to be as successful as I am is understanding these waves of success. A wave of success is when you start to become successful and you start to or you have an intention. Let's first off talk about that for a minute. In the old school way of understanding the Law of Attraction, we know that desire is such a good thing. That's what we. That's what we believe at least because we're told that and in the old paradigm, the desire was powerful because desire says that. Then we're going to focus on something else and then experience it. However, from the energy dynamics of reality, Transurfing desire actually blocks results because the more that we desire something, the more that we are emphasizing that we currently lack it in our own life. The key is to turn desire into intention. The difference between desire and intention is desire is a longing for something. It is just simply there and a desire is an acknowledgment that we don't currently have it, and intention is an acknowledgment that we quote, want to have it or a quote that in the present moment right now, we intend and expect for it to be coming into our lives. Experience and intention increase the probability of something we want to happen to actually happen. That's the difference. Start to set your intentions in your life and your life will begin to change. Set more intention. I intend to have a safe drive to the gym today. I intend to enjoy connecting to my coworkers at work. I intend to eat healthy food today. What do you intend for? Intention? Increases Probability and shifts you to the parallel reality you want because every parallel reality you can imagine already exists. It's about simply gliding through it, allowing manifestation to be easy, letting it be an easy process. That is what you can begin to do, is to set your intentions. This is the key with a wave of success. We'll wave of success is anytime something happens, you give it a positive meaning, whether it is positive or not, understand that positive depends on upon our perspective and our own choice. If you choose to give everything a positive, meaning your state of going up, you feel better. Then when something else happens, if you give it a positive meaning, you keep climbing up the moment you give some within a negative, meaning you didn't go down and your state of going down, which means you then experience a reality as equal to that may give emotion that negative state, so instead give everything a positive meaning. Even if you don't understand it in the present moment, it could be something appears to be bad, but you choose to see it in a positive way of how you could learn how it could be a synchronized link you up to somewhere else and it begins to change things for you. This is something that happens. Someone may lose a job, their state goes down. You say you know what? Maybe this is a good thing because I wasn't actually passionate about the job I had. You simply give them meaning to things in your life, but you also set the intention. Something I also helped create people do once again is setting that wave of success and helping people write it in a powerful way, and that is something you'll learn in the Reality Shifting Academy. 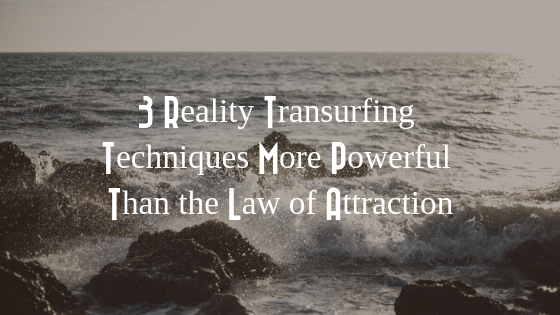 The third technique that will change your life if you begin to apply it as something Law of Attraction probably hasn't really talked about before, he'd never heard. Let me tell you a little bit of a story. This is on outer intention. I applied for this house, this House I'm renting, I'm not buying yet because in order to buy you have to, Oh, you know, in business for three years in order to qualify. And I've only owned my business at the time. I got this house for about two years. I wanted this house. I first off, I looked at about five or six houses, maybe four houses, I forget, three to four or five houses. I looked at all of them, um, that I saw and I didn't see anything that I really liked. There was one house I applied for, but it was kinda like, "Eh, I wasn't that crazy about it." I trusted the process. I gave it a positive, meaning that those houses weren't working out and that I wasn't really passionate about anything I saw yet. And in Vegas right now other than Las Vegas, everyone's moving here because of the sports teams and everything. So it's to get a nice house, sometimes a little bit more difficult. However, I simply knew what I trusted the process that I would eventually get the kind of house that was perfect for me. I like one story. I like bigger one-story houses rather than two-story houses because I don't like going up and downstairs. Not that I'm lazy or anything, but I just like big one-story houses for some reason, so I knew I wanted a one-story house. All of a sudden there's this house that becomes available, which is a house I live in now. When it becomes available, I literally sought the day that it came out. The next day I went and saw the house. I called the guy that was showing me houses. We come here, I look around the house and I fell in love with it. The energy was good. The people that lived in here before that owned the house actually, that are renting it out there when the lady is a Cirque de Solei performer, very InDesign type style stuff. They had like Zen decorations all the way around and was just like perfect for me because I love that Zen mentality. There's grass in the backyard, which I love it because I loved walking barefoot on grass with grass in the front yard and the side yard there are trees everywhere and in Vegas that's a very rare thing in it is all one big open floor plan that goes all the way back to the master bedroom is amazing. There's my own office on the other side of the house. There are two other bedrooms is just, it was the perfect house when I saw it. However, there was competition to get this house. There was about four, three or four other people for including me that applied for this house. I was like, "Ah, I got a little bit antsy." But I knew that using reality, Transurfing, I shifted the reality where this is my house and it didn't matter the other people that applied. This is what I did. I used to Reality Transurfing techniques. The first one is called outer intention. I imagined and tapped into the intention out of me, but of everyone else I intended, what I knew is that if I created videos here, I'd be in a high vibrational state and it would help more and more people in the world. This is where you tap into the universe manifesting for you because if you let the universe manifests for you, you know the ego doesn't have to do so much. The other thing is I have almost this house a form of consciousness in a way. I saw this house as an actual entity and said, this house wants me to live here. The plants want me to live here because I love plants. The House wants me to live here because I'm going to appreciate and take good care of the house. I tapped him to outer intention. Our intention is beyond the inner intention of me. Inner intention is I'm going, I want to do x, y, z like from within me, but the outer intention of me is other people's inner intention and the universe is inner intention. It's almost like I allowed it to flow through me. Then what I knew is that the landowners themselves, they asked one weird thing for people that it's not normal is asking the people that are applying to send pictures of their current house. I sent pictures of the current house that I lived in and the current house that I lived in at the time was very clean and what I did is I attach the photos. Then what I did, I sent them a letter because I knew that since they had that they want us to send pictures that they wanted someone who's going to take good care of the house. I said, listen, I want you to know that your house is beautiful. I want you to know that I think your house is amazing. I would appreciate living in your house. I would take very good care of it. I'm a very clean person as you can see from my photos. Also, I own my own business and I work a lot. I don't have, you know, I'm not throwing parties. I don't have any animals. I tapped into their inner intention and the next day I got the call, you got the house and that was a static and I knew that this was meant to be. I really feel like this house has meant for me to be in it because I also live close to the airport. I know I'm going to be doing a lot of traveling, but all of this happened because of Reality Transurfing the techniques that I appeal to them. It's called frayling in reality transfer. And there are all these techniques. What I teach in the reality shifting academy is all of these techniques plus more plus how to glide through this spot. It's called glide through the space of variations. There are all these different variables, all these different realities that you can glide through. Most people think I need to create my own reality that's rigid, glide through it, allow things to be easy. Reality Transurfing is about making the manifestation process so much easier than you can imagine.